Is the clock dangerously close to dinner time and you still have no idea what to make? Need something to eat before you run out the door to avoid dying of starvation later? Don't feel like cooking but really want something to eat? My favourite go-to meal has always been quesadilla. 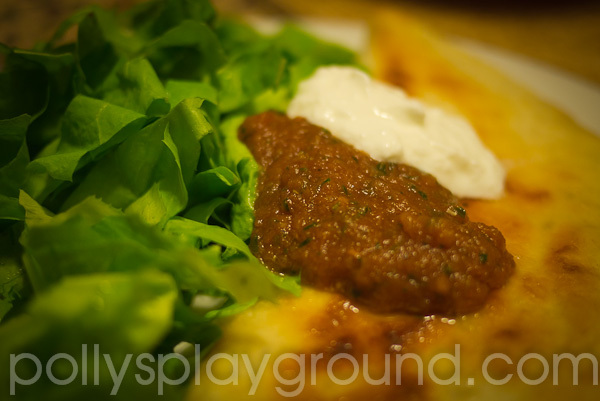 Throw something on a tortilla, add cheese, fold, fry, serve with lettuce, salsa and sour cream. Fast. Easy. Delicious. Unless you happen to be on an island in the middle of the Adriatic Sea. Fast. Easy. Delicious. *sigh*... well, one out of three ain't bad. There's never any need for hurry on this island and delicious is enough for me. As I've told you before, I've managed to conquer homemade tortillas and, while not as fast as opening a package, it really doesn't take me much time to whip up a batch of six. We always have cheese (though I do miss a good cheddar), our garden is still full of lettuce and sour cream, or kiselo vrhnje (the single most difficult item for me to pronounce in all of the Croatian language), is readily available at all local stores. But wait. A quesadilla without salsa? That's a total quesa-don't-a. But you know me; I absolutely refused to watch my go-to meal get up and leave so, after spending a good ten minutes staring at the cupboard shelves trying to materialize a large jug of Pace Picante out of thin air, I grabbed the lone can of tomatoes that was already physically present and decided to make my own. 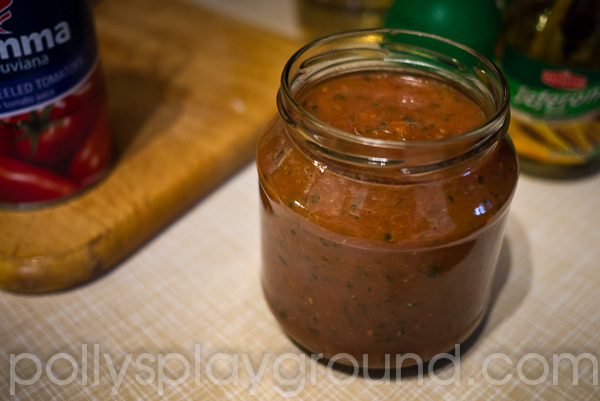 This is probably the easiest salsa you will ever make. It might not be the best you've ever had, but it will take far less time than a trip to the supermarket and will cost much less than grabbing a jar in the chip aisle at the convenience store. And it does taste fresh, even with canned tomatoes. Are you ready? Now whir it all up with your mixer of choice and.... snappity snap... salsa! If you like it a bit more chunky, dice one of the tomatoes and hold back half of the chopped onions and stir them in after you've blended (if you've got fresh tomatoes on hand you could dice one up and add it as well). 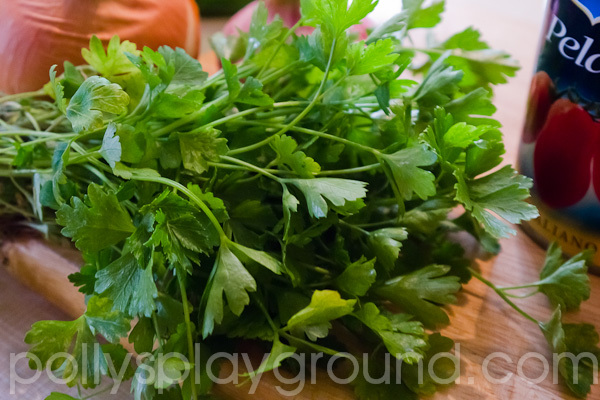 As with any salsa, the flavours are as varied as the people who eat it. Some like it mild and some like it hot; you'll need to adjust the heat level according to your own personal taste. The salt factor is negotiable too; if you'll be doing the dip with salty chips you might want to hold back a bit. If you like it sweeter, add more sugar. You get my drift.... Use this as a base and make it your own. 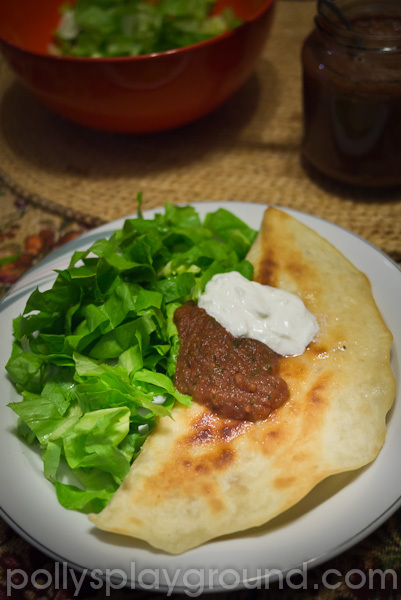 Quesadillas are once again fast(ish), easy and, as always, delicious. You probably have a nice big jug of Pace sitting on the top shelf of your fridge but, if you find yourself without, this is definitely a hit in a pinch. PS. Next year we'll grow more tomatoes. I'm a big fan of cabbage rolls. I'm not a big fan of making cabbage rolls. Okay, honestly? 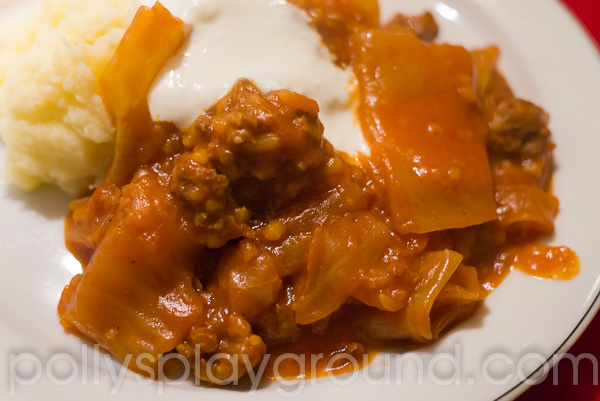 I've never actually made cabbage rolls... (no, that wasn't me, that was Saša who made the sarma); just thinking about the process of individually stuffing cabbage leaves completely puts me off. I prefer to practice a literal approach to comfort food; I seek comfort while the food cooks itself. But I'm a big fan of cabbage rolls. I needed to find a way to work this out. And, without using any boyfriend bribery, I eventually did. Woot! I'm going to tell you a secret. You can get all of the flavour (and infinitely more comfort) of traditional cabbage rolls by using the same ingredients sans stuffing and rolling. Yes, really. Don't tell your amazing cabbage roll making friends and/or relatives because they'll never make the real deal for you again if they ever find this out. You will need an average size head of green cabbage (or 2 small ones... or part of a massive one...), a couple of onions, about a pound of ground meat (I use mixed pork and beef), raw white rice, 2 x 500 g cartons of tomato sauce (that's roughly 3.5 cups for the imperialists - based not on mathematical conversions, but rather by pouring water in to my empty cartons to measure it just for you), honey, lemon juice, soy sauce, salt, pepper and garlic powder. You will also need a large pot (my 5.5 litre is just large enough to make this) with a lid. Once you have gathered your ingredients, heat a small amount of fat (butter, lard, oil... whatever makes you comfy) in your large pot over medium-low heat. 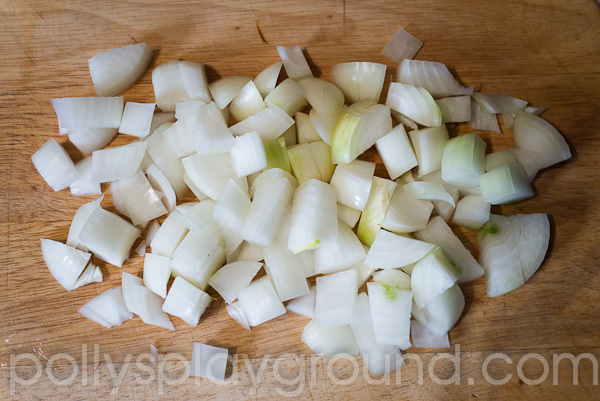 Chop up your onions and add them to the pot. You don't want to fry or brown the onions, you just want to heat them until they are soft and infuse the fat with their flavour - adjust your burner temperature accordingly. 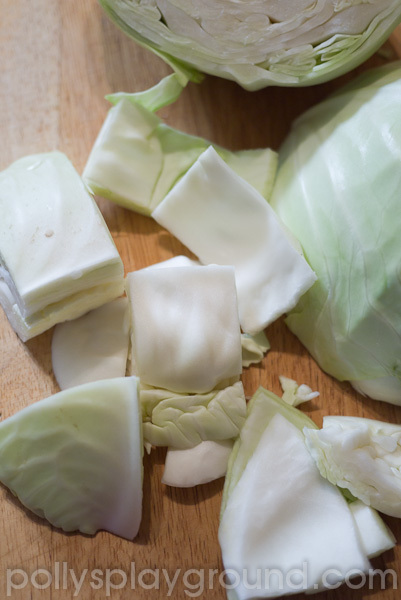 While your onions are softening, cut your cabbage into large chunky pieces. Loosely separate the cabbage leaves to break apart any too chunky chunks and give them a nice rinse under your kitchen tap to get rid of any residual yuck. 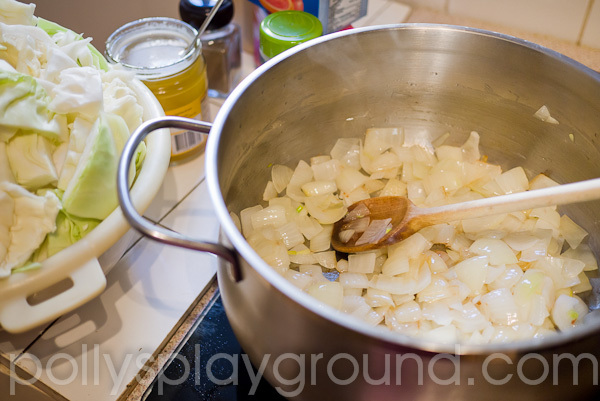 Add the cabbage to the pot, a few handfuls at a time, stirring to mix with the onions. Don't freak out if you can't fit all the cabbage in to the pot right away as it will shrink while it heats and will create room for more. Once you have added the cabbage to the pot (or in between adding handfuls), combine 4 soup sized spoonfuls of honey with 60 ml (1/4 cup) of lemon juice. 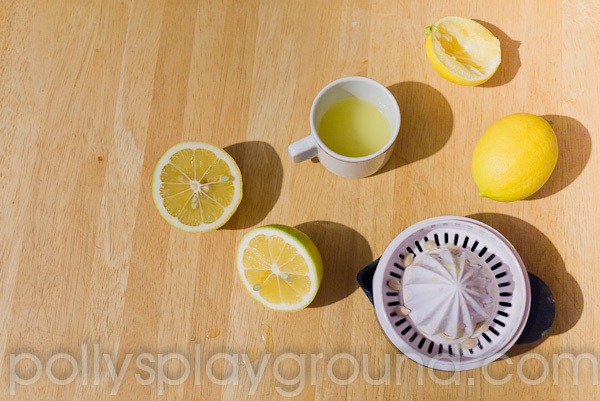 I recommend squeezing two medium sized lemons because fresh is always best - but use what you've got. Mix the honey/lemon with 500 ml (2 cups) water (I did mine right in the honey jar because I only had about 4 spoonfuls of honey left in there). Add the tomato sauce (1 kg or 750 ml-ish or 3.5 cups-ish...) and season with salt, pepper and garlic powder. 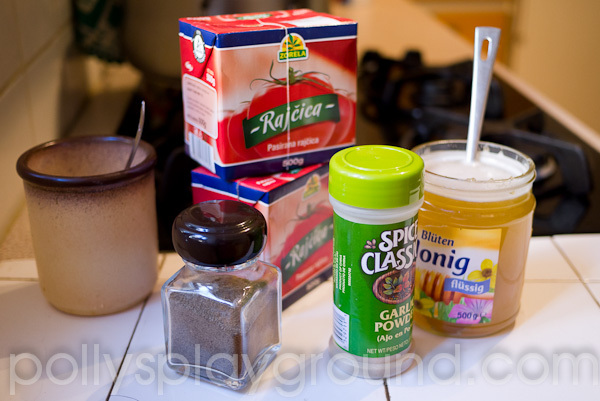 Your seasoning will depend entirely on your taste (and whether you used salted or seasoned tomato sauce) BUT... don't get too heavy with the shakers as you'll be adding some seasonings to your meat as well... and you can always add more later if needed. You have been warned. 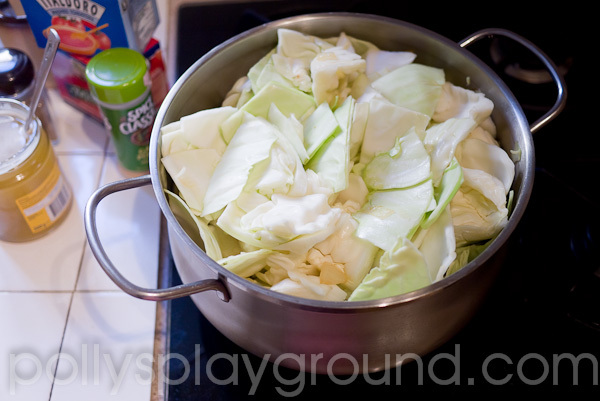 Pour the sauce over the cabbage in the pot, increase the burner temperature and bring to a boil, stirring occasionally. 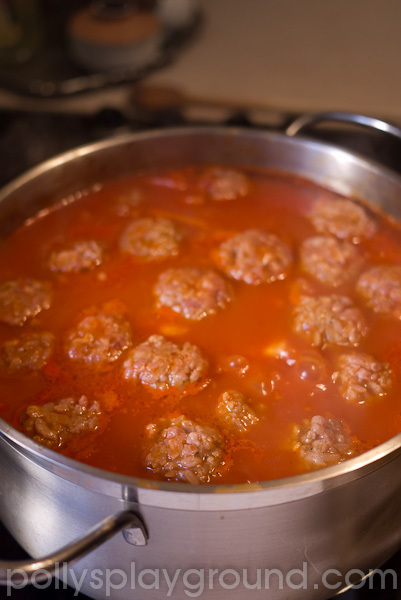 When the sauce begins to boil, cover the pot with a lid and simmer while you make the meatballs. 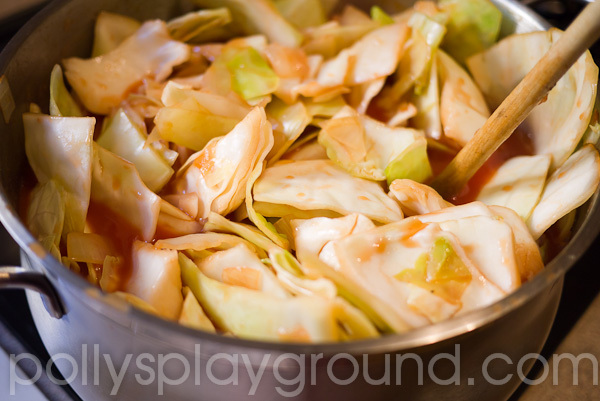 Don't worry if your sauce isn't covering all the cabbage - it will be eventually. As your cabbage simmers away in the sauce, it's time to make the meatballs. 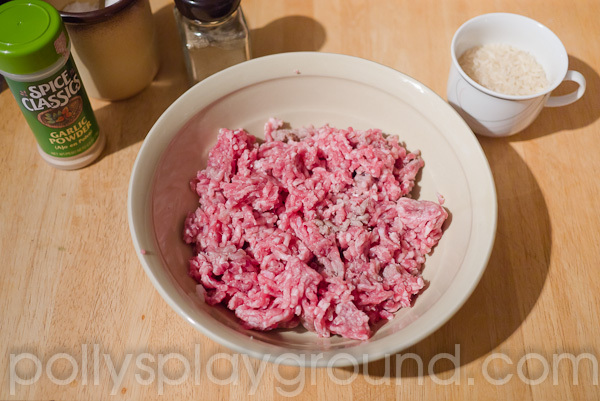 Combine your ground meat (excuse the brown bits in the photo - I left it to defrost in the microwave a few seconds too long) with 50g (1/4 cup) of UNCOOKED white rice, a splash of soy sauce (or worcestershire if you'd rather...), garlic powder, pepper and salt. As with the tomato sauce, the seasoning level is left up to you. Don't over mix or squeeze the meat, just gently toss the ingredients together until everything is combined. 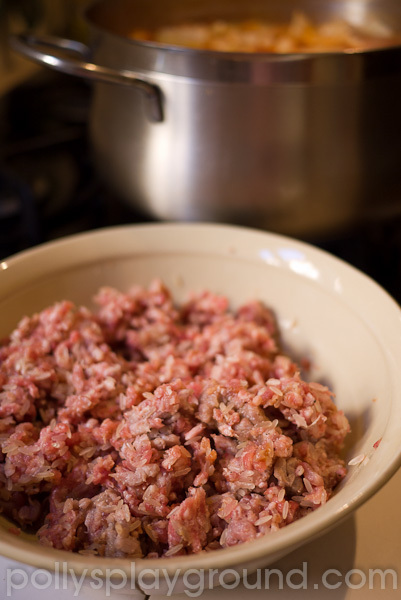 Speaking of meatballs, I should probably mention that,unless you don't mind having a layer of fat floating on top of the pot as you get ready to serve your meal, using lean ground meat will be your best choice. 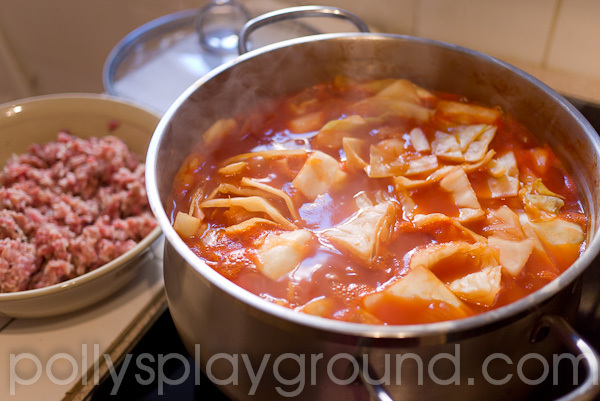 By the time you finish mixing your meat and carry it over to the stove, you will notice that your simmering cabbage is now nicely covered with sauce (see? I told you it would happen!). Form the meat mixture in to small meatballs and drop them in to the pot on top of the cabbage. When all the meatballs have been added to the pot, press them gently with the back of a spoon to cover them with sauce. Bring the sauce back up to a gentle boil (if it isn't already), cover, reduce the heat and simmer for 2 hours. Two whole hours!! That's ample time to get comfy. You may now kick back and relax while your home fills with the cozy scent of comfortable. As your meal makes away on the stovetop, do peek under the lid every so often to ensure that you are still at a simmer and to give it a gentle stir. My 'stirring' involves sliding a large wooden spoon down the side of the pot and stirring along the bottom so that I don't disturb the meatballs. Don't panic if (and when) your meatballs crumble... in the end you will have some random meaty bits throughout the sauce, but you will still have some nice big chunky lumps. After two hours of simmer (or longer - that's okay too), call everyone to the table and enjoy your comfy cabbage not-rolls. Serve with mashed potatoes and sour cream. 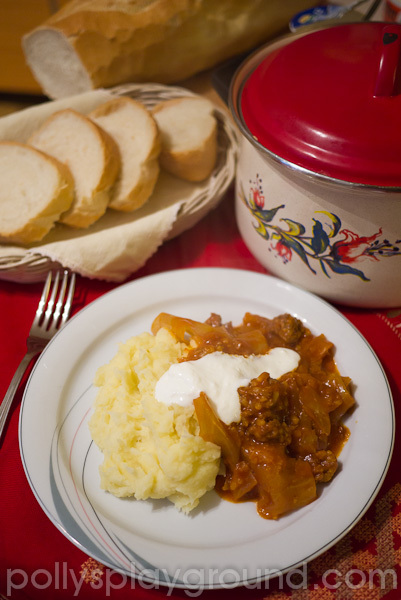 As promised, this dish is the epitome of comfort food and is sure to please the masses. I assume it will freeze well (we just eat it for three days straight... and it gets better and better each day). I did already tell you that this meal isn't pretty... but that's comfort food. You probably don't look your finest when you're donning decade old sweatshirts, flannel pajama bottoms and mismatched wool socks... but the way you feel when you're wearing them best explains my point. Seriously Curious: What's your all-time, absolute favourite comfort food and what makes it so deliciously comforting? Shoot me a short comment below or answer my question @ The Perfect Avocado on Facebook. I really want to know!